Tag line: "The Hunt is On"
I don’t remember the exact date, but it was sometime in early 1979 that my family bought our Atari 2600 game system. It was a fairly significant purchase for us at the time, one that set my parents back a bit, so we weren’t able to pick up any additional cartridges along with it, which meant the only game we could play for the first few weeks was Pong. But, hell, we didn’t care; it was damn sweet all the same. For my brother and I, those straight lines moving up and down, hitting that square ball back and forth, was about the most awesome thing we’d ever seen, yet it was my father who was truly blown away by this new technology (during that first night, he stared at the screen, repeating over and over, “I can’t believe we’re playing a game on the television”). It was a remarkable period, one that would change the face of entertainment for decades to come, and to have been there at the start of it all is something pretty special. Over the years, I had several “favorite” Atari games. The first was Adventure, which featured swords, castles, and dragons; and I was also a big fan of Superman (I thought it was so cool that you had to go into a phone booth to change from Clark Kent into the Man of Steel). There were others as well, including Missile Command and Activision’s Pitfall. And like so many other kids, I got E.T. The Extra Terrestrial for Christmas in 1982. Based on Spielberg’s blockbuster sci-fi / fantasy movie, the E.T. game was heavily advertised throughout the month of December, and by the time Christmas day rolled around, I couldn’t wait to play it. Well, by December 26th, I was done with it. As confusing as it was frustrating (you couldn’t take a step without falling into a goddamn pit), I took the E.T. cartridge out of my system and set it aside, and while I would occasionally pop it in over the next few months, I don’t think I’d play it for more than 5-10 minutes at a time. It was a major disappointment. E.T. the video game was so bad that some have credited it with destroying not only the 2600 system, but Atari in general, which, within a year or so after the game’s release, seemingly dropped off the face of the earth. To be honest, by 1983, the Atari 2600 was no longer my system of choice, anyway; more often than not, I was playing Colecovision or Intellivision, both of which had superior graphics. So, I always felt the company’s slide had more to do with its failure to adapt to an ever-changing industry than it did any one game. Of course, E.T. didn’t help matters (especially since the company, figuring it was a guaranteed hit, produced millions of copies that never sold), but to say it alone killed Atari isn’t exactly fair. So, what really happened to Atari? More to the point, where did their overstock of E.T. games end up? There were reports that the company buried millions of copies in the Alamogordo landfill in New Mexico. 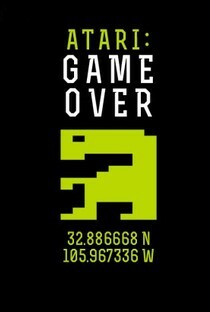 Atari: Game Over, a 2014 documentary directed by Zak Penn, sets out to discover whether or not this mass burial took place. Were hundreds of E.T. cartridges actually rotting under the hot desert sand, or was this simply another urban legend that people wanted to believe? Both Penn and his cameras were there when an excavation crew, hoping to set the record straight, started digging in Alamogordo in April of 2014. Many people, including a slew of gaming enthusiasts, were there as well, waiting patiently for workers to pull that Holy Grail of video games out of the earth. Joining the throngs who showed up at Alamogordo was Howard Scott Warshaw, the man who designed E.T. for Atari. By 1983, Warshaw had already been with the company for several years, and was considered their best and brightest. It was he who programmed Yar’s Revenge, one of the company’s biggest biggest sellers, as well as Raiders of the Lost Ark, another huge hit. So, when his superiors approached him late in 1982 and asked if he could design a game for E.T. in five weeks, Warshaw said “yes”. It was a tall order, seeing as it usually took 5-6 months to create a game, but Warshaw was confident he could pull it off, and after many sleepless nights and one very reassuring meeting with Steven Spielberg (who played the final game and gave it his seal of approval), E.T. was released to an anxious public… which promptly threw it back in Warshaw’s face. In truth, Atari: Game Over is as much Warshaw’s story as it is that of his most infamous creation. Through a series of interviews, which includes a visit to the building that once housed the Atari offices, Warshaw tells director Penn (who also narrates the film) how exciting it was to be part of those early days of the gaming industry, and how, back then, programmers and engineers were treated like rock stars. It was so amazing, in fact, that, for two and a half decades after it all went kaput, Warshaw struggled to find a job as personally fulfilling as the one he had with Atari. For years, he’s been the scapegoat, but throughout Atari: Game Over, many rush to Warshaw’s defense, saying no one could have turned out a decent product in the amount of time he was given. Along with telling the story of a bad video game, Atari: Game Over also sets the record straight, taking us behind-the-scenes to show what really happened, and who was truly to blame for the end of the Atari era. I was an Atari kid, too, so I loved watching this. I never got E.T., but my best friend did. It was certainly horrible. Btw, I also couldn't get any extra cartridges when my mom first bought mine. Thankfully, it came with Combat which had 27 different variations on that one cartridge. Used to play that for hours.